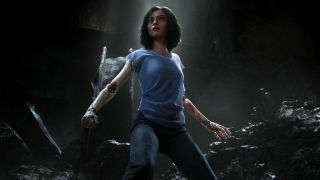 James Cameron (Avatar, Titanic) has been trying to produce a live action adaptation of Yukito Kishiro's classic manga series Battle Angel Alita for the last 18 years, and with the help of director Robert Rodriguez (Sin City, From Dusk Till Dawn), it's finally almost upon us with Alita: Battle Angel. Though the film's teaser trailer from January left audiences slightly befuddled by the titular character's unnervingly huge anime eyes, a new trailer has dropped in time for the 2018 San Diego Comic-Con which shows just how far Alita: Battle Angel has come in the last seven months — simply put, it looks like Cameron and Co. have (once again) taken visual effects to a whole new level. The stunning new trailer, which reveals more about the upcoming adaptation's story, shows what appears to be a fully realized futuristic world and is packed with fast-paced action. Based on this trailer, it also seems like Rodriguez and his CGI team have toned down Alita's uncanny valley appearance while still retaining her larger-than-average eyes. Rosa Salazar (Maze Runner: The Death Cure) plays Alita, a discarded cyborg who is found in a junkyard and repaired by Ido (Christoph Waltz). Though Alita cannot remember her past, it quickly becomes clear that she is a being of immense power. Before long, she gains the unwanted attention of Vector (Mahershala Ali), a man who wants nothing more than to destroy Alita for "threatening the natural order of things." Now, Alita must fight for her life and the ones closest to her. The film, which now shares a December 21, 2018 release date with Aquaman, looks set to be a visual triumph. Whether it'll draw audiences away from DC's upcoming underwater blockbuster is anyone's guess. Admittedly, it's quite funny that Cameron is going to have a film in theaters on Aquaman's release date, given that the director once broke (pretend) box office records with his own (fake) adaptation of the comic book on the third season of HBO's Entourage.